Pakistan captain Sarfraz Ahmed has joined Danube's family as brand ambassador for the Pakistan market. According to Sarfraz, this step could augur well for India-Pakistan cricket ties in future. Danube is known for its association with cricket and Sarfraz has been associated with the group before he joined the national team. He hopes cricket will benefit from this partnership. "I have a long association with Anis Sajan, Managing Director, Danube Group. And I have really been impressed with his passion for cricket. This is the most common thing between us," Sarfraz told Khaleej Times on Monday. "This partnership can play a positive role in India-Pakistan relations. The people of both the countries want to see the revival of cricketing ties between the two teams. 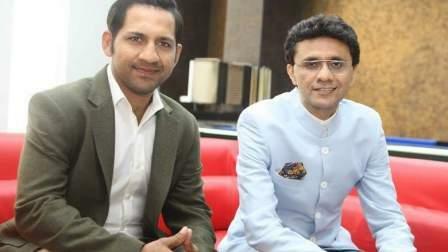 I really want to see friendship between Pakistanis and Indians and cricket can make that happen." Sarfraz, who is no stranger to the UAE domestic cricket, has played for Danube team in the past. "Danube has always helped young players hone their skills and some of the top Pakistani players - Fakhar Zaman, Yasir Shah and Asad Shafiq - were part of the Danube set up before they joined national team. Danube's services to cricket have been recognised by everyone and this is one of the main reasons for me to join the group as an ambassador for the Pakistan market which has huge potential for growth." Rizwan Sajan, Founder and Chairman of Danube Group, said: "We are honoured to announce Sarfraz as brand ambassador for Pakistan market. He and Danube have one thing in common and that is hard work. I hope our relationship will be fruitful and a lasting one." While addressing the media, Anis Sajan revealed his admiration for the Pakistan captain. "I have known Sarfraz for more than five years now and I am glad that this friendship has blossomed into a relationship with Danube. The thing I admire the most in Sarfraz is his humility. I can't see any change in his attitude even after achieving so much in such a short span of time," Anis Sajan said. "He has a great future ahead and I hope our relationship will help bridge the gap between two communities."